The argument that lead is in the water and is hurting kids has become the main selling point for Measure YY, the district’s school bond campaign. Though the bond is expected to generate $3.5 billion, only $45 million – less than 2 percent – would go to remove lead from school district water, district documents show. The San Diego Unified School District argues that any amount of lead in school drinking water is damaging to children. At the same time, it has found lead in water at some schools, does not remove all of it and is allowing kids to drink it. It’s possible the district could deal with many of its lead issues without passing a new bond. In fact, previous bonds have promised to replace old plumbing that would have alleviated at least some of the current lead problems in district schools by giving schools modern pipes. One TV ad urging voters to pass Measure YY opens with the 2018 elementary school teacher of the year, Georgeanne Gedney, seated at a kid’s table with four girls. They sip bottled water. “I buy bottled water for my students so they don’t have to drink school water with lead,” Gedney says. The implication is clear: The water at Gedney’s school isn’t safe to drink. Yet at Linda Vista Elementary School, where Gedney teaches, the school’s water is, for all intents and purposes, currently considered safe by the district. In May 2017, officials sampled five different taps there – a kitchen sink and several fountains – and all of them had less than five parts of lead per billion parts water. Typically, lead is coming from deteriorating fixtures and pipe joints that contain lead. The district adopted the five-parts-per-billion standard last summer following media scrutiny and parent outcry over a series of tests that found leaded water in schools across San Diego. At first, the district argued there was no reason for alarm unless its water contained 15 parts of lead per billion parts water, the standard the federal government set for city drinking water. But public health officials have long said that lead is unsafe at any level, especially for children and their developing brains. Lead can cause a host of health problems, including behavioral disorders. The district has now changed the way it views the safety of leaded water. “If a kid is drinking any level of lead, it is damaging to that child,” said district spokesman Samer Naji. It will take three to five years to test every tap in every school – 7,200 taps – and then either replace pipes, pipe joints and fixtures or install water filters. 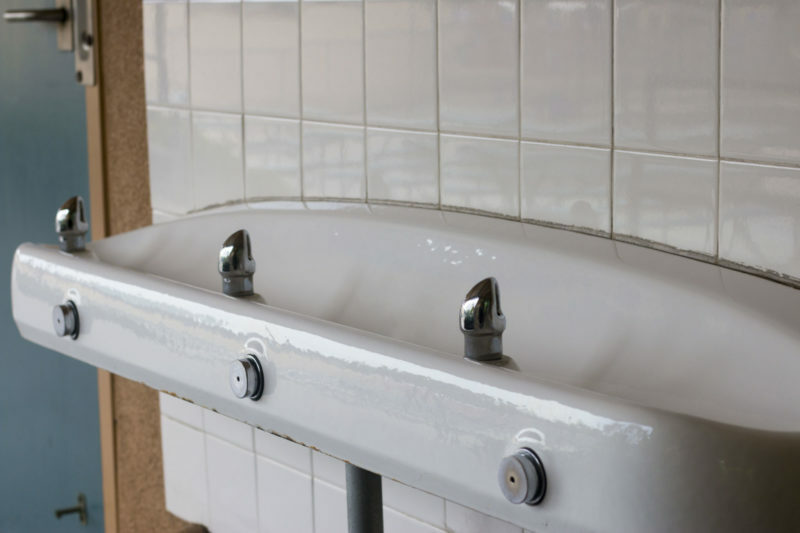 So far, San Diego Unified has tested 1,877 taps. Of those, it’s found and fixed 266 taps with higher-than-allowed lead levels. In the last budget year, the district spent $372,000 on that effort. But because it doesn’t yet have a plan to get lead down to 1 part per billion, that’s meant leaving some lead in some schools, like a tap at La Jolla High School that has 4.4 parts of lead in its water. In the meantime, the district is still asking schools to flush lead from their pipes by running water every so often – an interim step that reduces the amount of lead that ends up inside students’ bodies. That could change, though, because last fall the district announced an even stricter goal: of having less than 1 part of lead in its water. That’s ambitious – though not quite as stringent as the state’s own ambitious and unenforceable “public health goals” for how clean people’s drinking water should be. It would also be costly, but the district wasn’t sure how much. The new lead standards were being talked about at the same time as officials were talking about the need for another school bond. Eventually, money to update plumbing systems was folded into the bond. The district’s best guess is that it’ll need about $45 million to get from 5 parts of lead per billion to 1 part. Andy Berg, chairman of Safety and Learning for Our Schools, the campaign committee that ran the ad about Gedney, acknowledges there is still $2 billion in unspent money from previous school bonds. But he said the district can’t spend that money on new plumbing systems that would replace all lead pipes – even though previous bonds specifically promised to update old and deteriorating plumbing systems. He said that’s because of a court ruling that forced the school district to pay back bond funds it had used to install stadium lights. The stadium lights had never been written into the previous bonds, a group of residents successfully argued the district couldn’t use bond money to pay for them. Berg’s argument is that if the district tried to spend money from previous bonds to fix the lead problems, a judge might stop the district. He said that’s because none of the previous bonds specifically mentioned replacing newer lead pipes, they only mentioned updating old plumbing systems. District records indicate six out of 11 schools flagged for having lead levels over the state and federal limits have yet to see any bond-funded plumbing work, despite ballot pledges specifically for those schools in 2008 and 2012 to ‘Repair/replace deteriorating plumbing and sewer systems’ or ‘Upgrade old plumbing and sewer systems,’” VOSD reported in July. Fixing that plumbing could have fixed the lead problem in those schools. More broadly, Berg argues that a bond would need to come before voters in the next four to six years, anyway. That’s because the district identified $8 billion in facilities needs even before either of the past two bonds were passed, he said. Those bonds totaled $4.9 billion. Though removing lead from water would represent a tiny fraction of the new bond spending, Berg said the lead issue was bond advocates’ “best message.” It seems likely to play better than, say, installing energy-efficient lighting or repairing portable classrooms (which are often supposed to be temporary anyway), two other things bond could also help pay for, among many others. Still, those things need to be done, which is why Berg said they were all folded together into one bond. In the run-up to its 2012 bond, Proposition Z, the district highlighted asbestos concerns. But in the aftermath, the district didn’t bother calculating how much money it spent removing hazardous materials. And in fact, officials decided much of the asbestos was safe, because it was not airborne, and decided not to remove it. The lead is there, too. Yet much of it exists at a level officials – including those who run San Diego Unified – have until recently said is safe.